From September 2013 to August 2014, I had the privilege to work with the esteemed non profit, Medic Mobile through my work with Engineers for a Sustainable World (ESW). There, I was working with them on two major projects: Medic Mobile In a Box and a Design Fellowship. My first project, spanning the majority of my time with Medic Mobile, was from September 2013 to June 2014, working on Medic Mobile in a Box. I was the project coordinator for the Medic Mobile project through Stanford Engineers for a Sustainable World chapter. 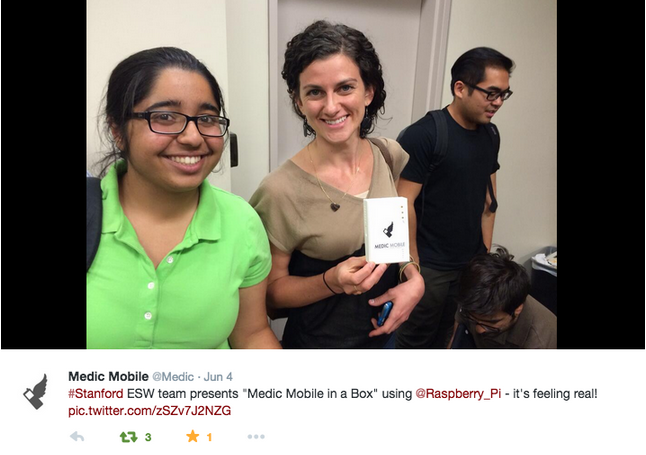 The concept behind MM in a Box was to have a physical, local server, hosted on a Raspberry Pi, to collect the SMS data from community health workers in Nepal. The project specifications included: "This will enable distributed servers with GSM and data connectivity for mobile clinics and community health workers...The RPi, MM software, and hardware add-ons can also serve as a diagnostic hub for frontline health workers..."
We succeeded in building MM in a Box to receive and store text messages and load the MM software on the Pi, enough to be able to test in summer in Nepal. In the summer, from June 2014-August 2014, I was able to join the team as a Design Fellow, as a part-time internship. I worked with the Senior Designer, Dianna Kane, in working on developing the communication materials for the maternal mortality use case. I worked with graphic designers to develop to final products and provided feedback to the team along the way.